One of the things that struck me most about Beijing was the sheer size of everything. Beijing, it often seems, is built at a Las Vegas scale – the buildings, the roads, the airport – it’s all huge. The size can be deceptive when looking at a map, it is not unusual for a city block in Beijing to be 500 meters long, so you might look at a map and say: “hey look that’s only 3 blocks from here! let’s walk over there.” A kilometer and a half isn’t a long walk – but it is if you were expecting to walk 3 or 4 hundred meters. Of course, there are lots of small things in Beijing, lots of weaving alleys (indeed, it sometimes felt like there were only two types of streets in Beijing 6-10 lane super roads, or tiny alleyways and side streets) but the grandiose parts of it dominate the experience. More interestingly, this is not a recent thing. The Forbidden Palace – world famous and which I first remember being introduced to while watching the visually stunning The Last Emperor in elementary school – is perhaps the best example of how big has always been a part of Beijing. The complex – which was home to China’s emperor since its completion in 1420 – spans an area of 178 acres. If, like me, you find that number hard to assign meaning to, I thought I’d visualize it against an American and Canadian landmark that would make it easier to understand. All of these images are taken from Google Map at the same scale. 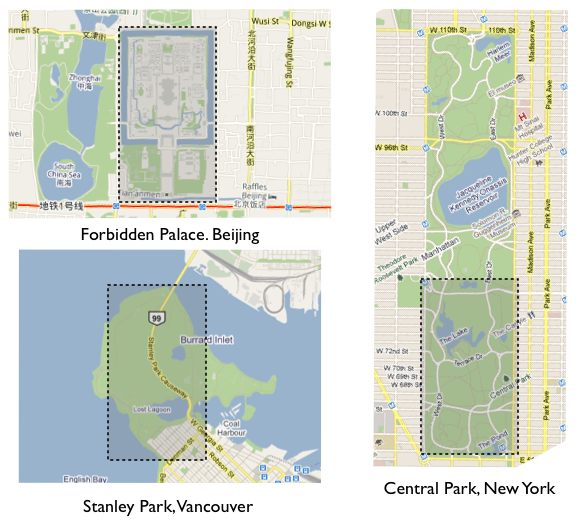 The top left hand image shows the Forbidden Palace in Beijing, the lower left shows the same area super imposed over Stanley Park in Vancouver and on the right super imposed over Central Park in New York. What’s amazing is you could literally pour all of Stanley Park into the Forbidden Palace and have room left over, while the complex consumers around 40% of Central Park. Mind boggling. I also hope this blog post demonstrates how a simple visualization can be much more powerful than numbers, even using common tools like Google maps and keynote (powerpoint for Mac). This entry was posted in commentary on June 20, 2011 by David Eaves. I’ve been to Beijing 5 times now and the sheer scale of the buildings and streets still amazes me! I wrote some posts on this during my trips… I’m too lazy at the moment to link to the exact posts, but if you are so inclined, go to my blog at trashysworld.ca and do a search on Beijing, you’ll find them soon enough.